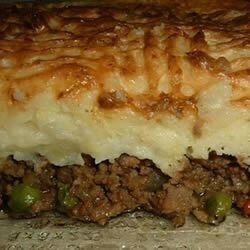 "This savory beef pie is so easy to make and is one of my husband's favorites. The leftovers are perfect for lunch the next day. For added flavor, you could top the potatoes with a cup of shredded Cheddar cheese, if desired." Place the potatoes into a saucepan and fill with enough water to cover. Bring to a boil, and cook for 15 minutes, or until tender. Drain and mash with margarine and milk until fairly smooth. Meanwhile, crumble the ground beef into a large skillet over medium-high heat. Add onion and bell pepper. Cook and stir until beef is browned; drain excess fat. Place the beef and onion mixture into the bottom of the pie shell, pour the cream-style corn over it. Spread mashed potatoes to cover the top of the pie. Bake for 30 minutes in the preheated oven, or until the pie crust and potatoes are golden brown.